Note – This article is the first of a five part series by Leavenworth Washington photographer Dominic Urbano on vacationing and photography on Kauai. “The Grand Canyon of the Pacific” So dubbed, the Waimea Canyon has quite a reputation to live up to. It does not disappoint. Driving to Waimea Canyon, the hike to the Upper Waipo’o Falls, and visiting the Kalalau Valley lookout, were at the top of our list of destinations on Kauai so we decided to head to Waimea on our first day. We had heard that the weather could really diminish the views at the Kalalau Valley so we decided that by going there on our first day if the clouds and mist were lingering we would have additional days to try again. We were fortunate and the weather was perfect. Waimea Canyon lived up to its billing as the Grand Canyon of the Pacific. A deep and colorful canyon with waterfalls and rolling mist, Waimea Canyon is a must see if you are visiting Kauai. Additionally there is much more than to see than canyon if you make this trip. The same road that leads you to Waimea Canyon leads you to the Kalalau Valley lookout high above the Napali Coast, Pu’u o Kila lookout, and the Alkali Swamp trail-head. We ended up visiting the area twice. Once for our hike to Waipo’o falls and again for our hike on the Alaki Swamp trail. There are two roads you can take to drive up to Waimea Canyon. I highly recommend taking Waimea Canyon Drive. It is marked on maps as Highway 550. Watch for the turn as you drive through the town of Waimea. The turn is about ¾ mile past the Russian Fort / Elizabeth State park as you are driving into Waimea. It is not well marked and the bigger signs for Waimea Canyon will take you to a different road three miles further on which is a newer but less interesting route. Once on Waimea Canyon drive… grab a low gear, enjoy the twist, turns, and great views. The trail is moderate/easy and we had no trouble finding our way to Waipo’o Falls and back. There were two highlight sections for this hike. An open ridge area overlooking the Waimea Canyon and the Waipo’o Falls themselves. The open ridge area provided the best views of Waimea canyon that we saw on our trip. (Including a helicopter fly over) After dropping into a small valley the trail works its way back up to this open dirt ridge. The view straight into the heart of Waimea Canyon is spectacular. Following the trail down the steep dirt ridge brought us to the upper Waipo’o falls. The area of the upper falls is actually a series of small terraces. The water falls and pools onto these terraces before making a long drop to another terrace and the final drop as the lower falls. The longer upper falls and the very long lower falls are not actually visible while standing on the upper terrace areas. The small terraced falls and pools are beautiful however and the hike is well worth the effort. After our Canyon hike we continued up the Waimea Canyon road to where it ends at a small parking lot. (there is another parking lot slightly before the end of the road that gives access to another lookout… but the view is better from the end of the road) Here you will be at the Kalalau lookout. The elevation at this point is over 4000 feet and the view down the Kalalau Valley to the Napali Coast is hard to discribe. No photo or words can capture what it is like to stand on top of this steep canyon as moisture from the Pacific Ocean rolled as mist up the canyon walls. You really have to be there. Cloudy or too much mist at the time of your visit to the lookout? Come back. 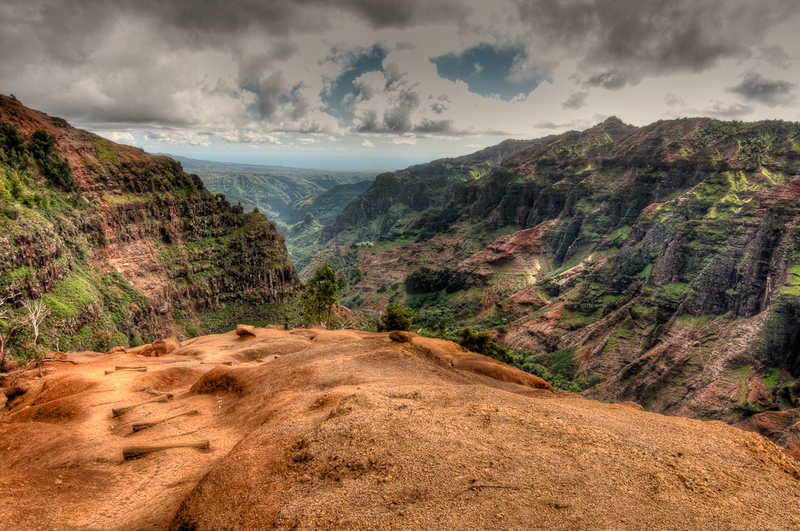 You shouldn’t leave the island of Kauai without seeing the view from the Kalalau Valley lookout. Fine art metal prints are available by contacting Dominic directly. At 4:30 pm we started down the mountain. Polihale State park was marked on our map and we figured that there was just enough time to make it to the beach in time to catch a sunset. We made it in time for a beautiful sunset and although our visit to Polihale State Park Beach was short, it was a spectacular place. A long soft sand beach that ends with the sheer cliffs of the Napali Coast. The rich colors of a Pacific sunset as seen from Polihale Beach on Kauai. The sand was deep and soft. I am not sure how else to describe it. I have had the sand of many a beach between my toes but this was different. The softest sand beach I have ever been on. Steeply sloped to the water it doesn’t look like a good spot to wade or swim but the view in any direction is beautiful. Especially in the direction where the yellow sands meet the abrupt cliffs of the Napali Coast. There are multiple access points to the beach at Polihale and you will see that some people are driving right out onto the beach. I would advise parking where the ground is still firm. Only people with both experience and the right rig should ever venture onto the sand of a beach in a car. In my travels I have seen many a rig (four wheel drive or not) stuck right up to the axles in soft sand. San Juan Islands and Mount Baker photos and hiking.